Happy New Year you, J and S! Hope the year is everything you want it to be! Happy new year and thank you for your inspiring posts from good things downunder! Lovely! Happy New Year! Cheers & looking forward to many more terrific "Food Wanderings"! Love the picture. Happy new year to you Shulie! Miss talking to you! Love the pic, simply gorgeous! Love this Shulie :-) Wishing you all the best in 2012!! Thank you all for your heartfelt comments and warm New Year's wishes. I wish you all the best that 2012 has to offer. Much health, first and foremost, happiness and success!! What a cool holiday card:)Gorgeous photo and yes, thyme flies;) xo Happy New Year my sweet friend. Happy New Year, Shulie! 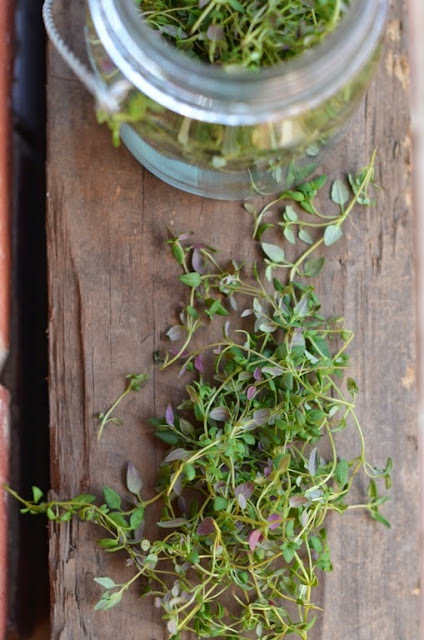 How timely, my thyme [outside] is already coming back, and it's still winter. I finally popped open the laptop. Cobwebs. I am blown away by your recent photography!Happy New Year Shulie to you! I've enjoyed your many posts on your site, especially the lovely photography. I love your recipes as they utilize many flavors I wouldn't think to use!